Did you know the type of office furniture you buy can truly affect your work productivity for the better or worse? Having good work performance is crucial to generating profit for your company. When you want to make more money for your company, you should make a big investment in ergonomic furniture, particularly ergonomic chairs. How can ergonomic office chairs and overall ergonomic furniture improve work performance while generating big bucks? The quality of your office furniture can affect the quality of work. Workers that are in good health perform better than workers in poor health. Good office desks and office chairs are crucial to excellent work performance. When you are looking for great functionality and style, you can always count on Mark Downs Office Furniture. We have high quality steel case ergonomic chairs. 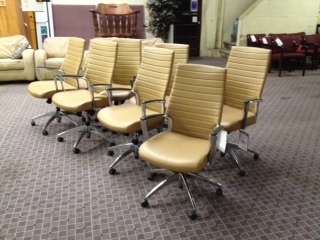 We offer fully adjustable ergonomic office chairs. Our ergonomic furniture ( no matter used or new) always offers visual appeal and great user friendly solutions.Our furniture lines offer so much ergonomics. We want to help you identify how you can work better and get work done faster by using high quality ergonomic furniture. The extra comfort will improve your overall work efficiency. If you don’t believe you can make your work operations more efficient, you need to take a closer look. There’s always a way to make working more efficient, you can start improving your work productivity by buying used and new furniture from Mark Downs Office Furniture. This entry was posted on Monday, May 12th, 2014 at 2:33 pm. Both comments and pings are currently closed.